This is a fun, free printable algebra game for 1 to 4 players. Then cut out the 16 algebra questions, but leave the last page as is. Place the 16 algebra questions so all the questions are visible, put the board with the X and Y circles next to it and find a couple of dice. Each turn any player throws the 2 dice and moves them so that one is in the X circle and one is in the Y circle. In the example on the right, x = 1 and y = 6. All players then race to do the maths and find an algebra question that fits. In this example, x + y = 7 is one possible answer. When you find a suitable card, you grab it. - In a solo game you remove the card from play and add 20 seconds to your time. - In a 2 player game, you give the card to the other player. - In a 3 or 4 player game, you remove the card from play and can't play on the next go. The dice are then rethrown (only one card is taken per round). Play continues until for any given round all players agree that there's no possible answers to any of the algebra questions that fit with the dice rolls. At this point, turn the board over (so it's just a blank piece of paper). 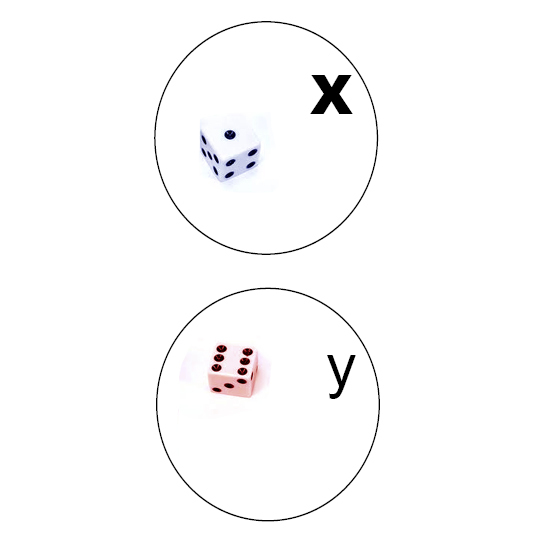 For the rest of the game, players can then choose either die roll as x and the other as y. Play stops when there are only 3 algebra questions left untaken. At this point each player counts how many cards they have and the player with the most cards wins. For a solo game the rules are the same, except that you need a timer and race to see how quickly you can win. We hope you enjoy this free printable algebra maths game! Feel free to share it.